Two-Per-Day Tablets: Our Two Per Day formula gives you more of the essential vitamins, minerals, and other nutrients your body needs. 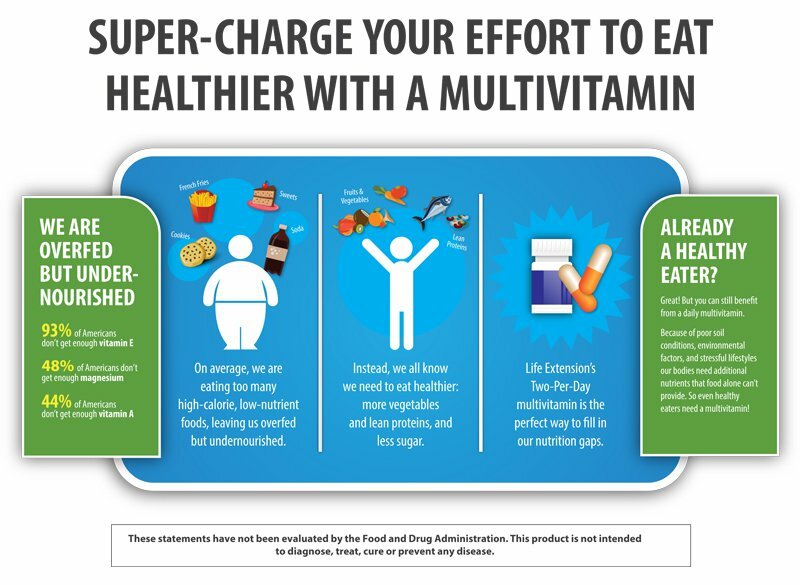 This is important because Recommended Dietary Allowances (or RDAs) provide only the minimal doses necessary to avoid deficiency. But in order to achieve optimal health and well-being, you need the ideal dose of high-quality vitamins and minerals every day. Our soy-free Two-Per-Day Tablets contain the bioactive form of the B-vitamin folate, 5-MTHF; zinc citrate; the mixed tocopherol form of vitamin E, and more. 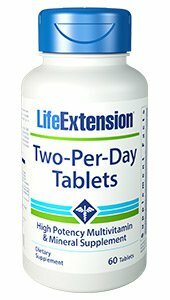 Get the most out of your multivitamin with Life Extension Two-Per-Day Tablets. Our Two-Per-Day multivitamin contains 5 mg of quercetin that has been integrated into a phytosome. A phytosome is a phospholipid sphere that encases a botanical compound, aiding in its absorption and making it more bioavailable: this quercetin is up to 50 times more bio-available than standard quercetin. Quercetin supports cellular health, endothelial health, healthy immune function, and more. Chromium helps maintain healthy blood sugar levels already within normal range. Crominex® 3+ is a highly stable and biologically active form of chromium optimised with Capros® amla Indian gooseberry extract to promote endothelial health and PrimaVie® shilajit for cellular energy. Your body needs B vitamins to release energy stored in carbohydrates, fats, and proteins — energy your cells use to carry out their daily functions. But there’s more than one “vitamin B.” And because they are metabolically codependent, B vitamins work together to keep you healthy. That’s why our formula contains readily metabolised forms of vitamin B1, riboflavin (B2), vitamin B12, vitamin B6, and more. 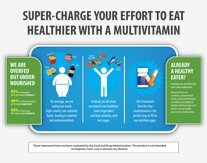 For optimal health benefits, mixed vitamin E tocopherols are some of the most valuable forms of vitamin E. For bio-markers of oxidative stress and inhibiting inflammatory factors, evidence shows that combining alpha- and gamma-tocopherols is better than taking either nutrient alone. Our formula provides more than 80 mg of mixed alpha, beta, delta, and gamma tocopherols. Selenium — Selenium supports heart and brain health, promotes a healthy inflammatory and immune response, helps quench free radical activity. Our-Two-Per Day formula has three unique forms of selenium (200 mcg total): SelenoExcell®, Se-methyl L-selenocysteine, and sodium selenite, each form acting along a different biological pathway. Apigenin — This powerful botanical bioflavonoid is found in many fruits and vegetables. Apigenin helps boost the body’s natural cellular defences. Marigold extract — Standardised for both trans-lutein and trans-zeaxanthin, the marigold extract in our Two-Per-Day formula promotes ocular health and helps inhibit oxidative stress.